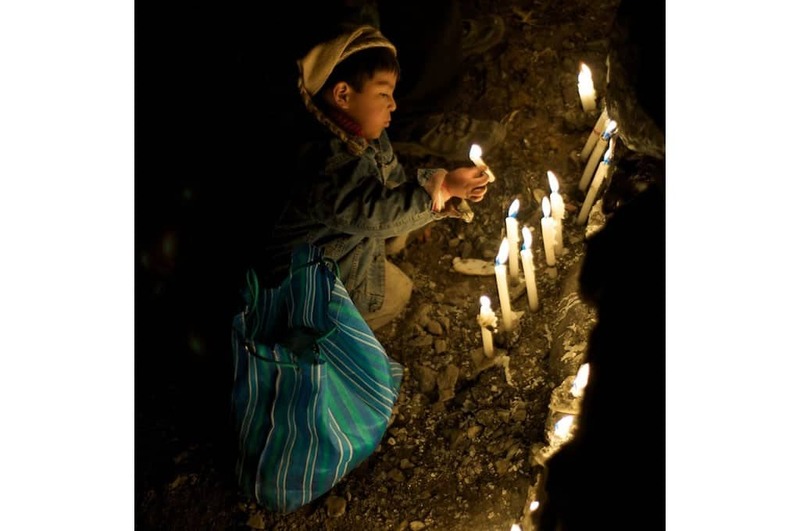 The Qoylloriti pilgrimage is without a doubt one of the most incredible treks you can do in the Andes. Immerse yourself completely in Andean culture in a gorgeous setting, surrounded by glacial peaks. 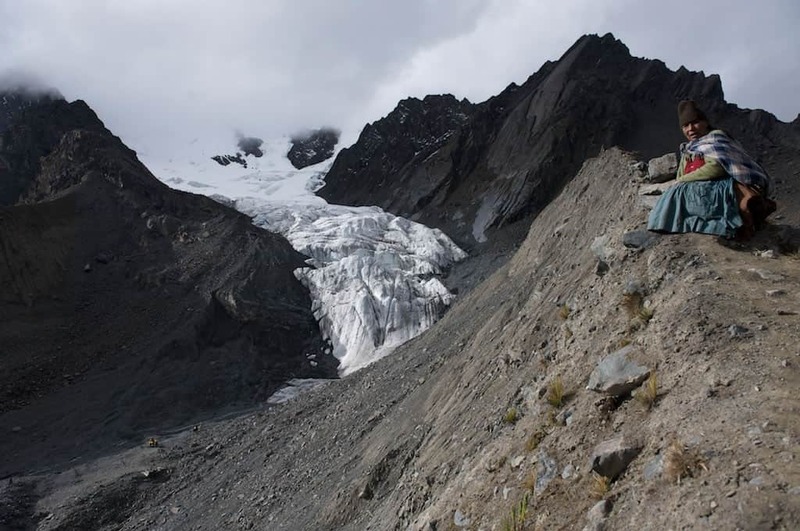 You will join hundreds of Andean pilgrims on the Qoylloriti pilgrimage as they make this important religious trek to venerate the Lord of Qoylloriti. 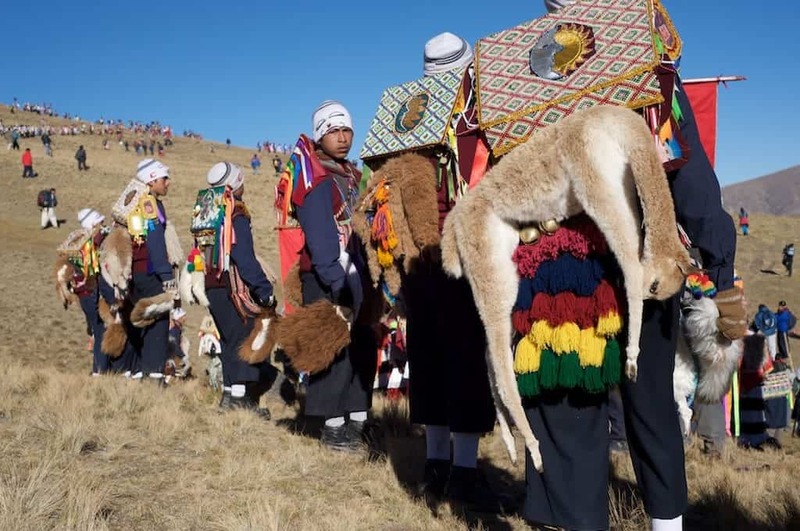 Colorful dancers and other devotees travel from surrounding communities to venerate the Lord of Qoylloriti in this incredible blend of Catholic and Andean faith. 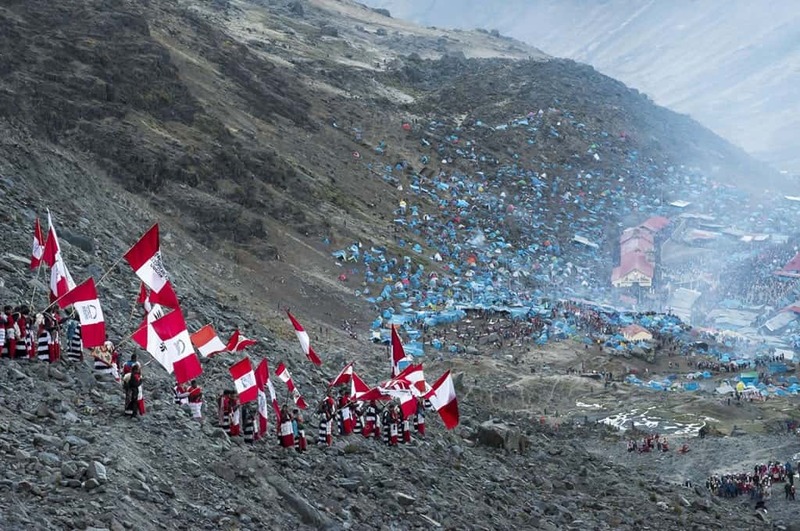 The Qoylloriti pilgrimage takes place every year at the base of Mt Sinakara in the Ausangate area, just days before Corpus Christi is celebrated in Cusco. A spectacular location, colorful atmosphere and physical exertion make this an experience one not to be missed! Read more about this fascinating festival of Qoylloriti on our Cultural Events page! Apus Peru is one of the few trekking companies that offers the chance to experience the full 4-day Qoylloriti pilgrimage. We also offer a 2-day trek to Qoylloriti for those short on time but who still don’t want to miss out on this incredible cultural experience. 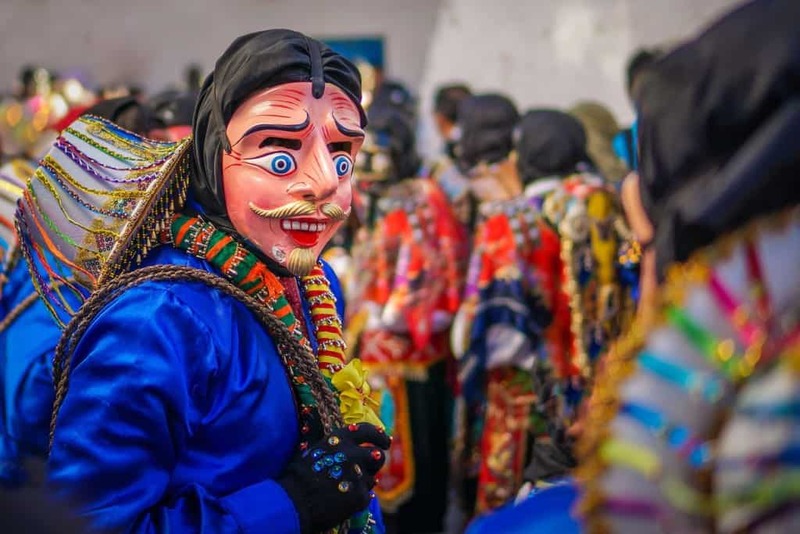 Fellow pilgrims, musicians and dancers from all over Cusco in colorful costumes; a fascinating market of miniatures where you can buy what your heart most desires to bring good luck; stunning glaciers; and an air of festivity and spiritual devotion. Prices are per person in USD, based on group size. We do not have fixed-date group departures. If you do not want to book a private trek, please see our Trekkers Wanted page for a list of open departures within your dates. Tent: 2 people in a 4-person tent, allowing for greater comfort and backpack storage! Basic foam mattress. If you require greater comfort during the trek we can rent you an inflatable mattress. See Optional Extras & Upgrades below. Cook and cooking equipment, plus assistants for larger groups. Meals as indicated in the itinerary. Our professional cooks prepare a combination of traditional Peruvian and Western cuisine. Talk to your guide if you have certain preferences! Vegetarian, vegan and gluten-free options available. When served, salads are washed in boiled water. Horses and horsemen, who carry camping equipment, food and kitchen utensils. We provide duffel bags at your briefing for your personal items (up to 7kg/15lbs per person). Breakfast on the first morning. Dinner on the last day. Sleeping bags. Available for rent if you don’t have one with you. We offer you the opportunity to personalize your trek and make your experience more comfortable through our Optional Extras and Upgrades. All options are available during the reservation process; please ask your sales consultant for more information. Light-weight aluminum walking stick. Two sticks are recommended for tough hikes. When calculating the cost of renting equipment, calculate using the length of the entire trip, not just the number of trekking days. Please be careful with rented equipment! You are responsible for the cost of replacement if something is damaged or broken. Any upgrades or trip extensions must be requested at time of booking. Children 0-4 years: Free. A valid passport must be presented upon booking. Children under 4 will not count towards the total number of guests in a group. This discount does not apply to train fares. Children under 2 will not be considered to occupy a seat on any train or bus, and instead must ride on a parent’s lap. Each guide has their own preferred route and so the route you trek might not correspond exactly to the route described here. The times cited in this Qoylloriti pilgrimage itinerary are approximate. Walking times depend on the group, and the guide may change lunch spots and campsites depending on the progress of the group. The Ausangate region is at very high altitude, and you’ll be hiking close to glaciers and snow-covered mountains. Translation: it’s very cold! Temperatures can fall well below zero at night. We strongly recommend using a sleeping bag good for at least -15˚C. This is a totally off-the-beaten-path trek, and tourist infrastructure is very limited. Instead, we’ll be making use of local facilities where possible. Please note: this is a true adventure and things may not go exactly according to plan! Keep an open mind and let yourself enjoy the cultural differences you may experience. Most of all, remember you are joining a genuine Andean fiesta, an event with real meaning and importance to the local community, and at which you are a guest. You should be willing to accept their means and methods of celebration. Please be respectful. Please refer to our Responsible Tourism pages. You can also ask for our Traveler’s Code of Conduct guide. There is always an opportunity to learn something! Our Qoylloriti pilgrimage begins as we leave Cusco early and travel by car along the Transoceanic Highway. We arrive in Mahuayany about 3 hours later, passing by Tinqui, the trailhead for the Ausangate treks. As we travel, we pass through spectacular landscapes and stop for photos along the way at Urcos, Ccatcca and Ocongate. We will have an early lunch with other pilgrims at Mahuayany (4600m), which will be full of visitors! After lunch, we start our pilgrimage to the Sanctuary of Qoylloriti at the base on Mt Sinakara, a breathtaking spot surrounded by snow-capped mountains. It is a slow, 3-5 hour uphill hike, and we will pass the 14 stations of the cross along the way. In the evening, we can attend mass at the Sanctuary. We will have dinner and camp at the Sanctuary. Note: The Qoylloriti Sanctuary is located at a very high altitude. You must be well acclimatized! Our second day on the Qoylloriti pilgrimage, we spend the full day at the Sanctuary, watching and learning about the activities of the pilgrims. We attend the “alacitas” market in the morning where you can buy miniature goods such as trucks, houses, cattle, university titles and anything that your heart desires! The legend says that whatever you purchase and then sacrifice to the Lord will come true, thanks to the power of the Lord of Qoylloriti. The morning mass at the Sanctuary is the next event followed by the “Pablitos” mass. The afternoon is reserved for other activities: the procession of the Lord of Tayancani and the Virgin, several dancing performances, and mass at the Sanctuary again in the evening. At night, after dinner, we enjoy a spectacular Andean fireworks show where wooden constructions with fireworks are set alight. Afterwards, the pilgrims ascend to the glacier to bring down the crosses to the Sanctuary. We retire to our tents. After breakfast and a last look at the celebrations around the Sanctuary, we will get ready for the Qoylloriti pilgrimage. We wait and attend the Blessing Mass and then leave in the so-called “24 hour procession” together with the rest of the pilgrims. The procession leaves from the Sanctuary and runs through Calvario Machucruz, the lagoons in Kumukasa and Alqamarina sectors, until reaching Yanacocha, where we arrive at around 6 pm after about 6 hours of hiking. At this point, we can either rest for 3-4 hours until 10:00 pm, when we start walking during the night towards Tayancani with the other pilgrims. Alternatively, we can opt for an early rise (around 4am) to catch the sunrise over Ausangate and a slightly late arrival at Tayancani. This will be discussed and decided upon among the various members of the group during the trek. If your group opts for the night pilgrimage – an incredible experience! – we will wait for the sunrise and the impressive Sun Greeting Ceremony at 7am before we descend to Tayancani and attend the Blessing of the Sanctuary and the town of the same name at 8am. We can attend mass at 10am and then follow the trail 2h up a mountain pass and then down another hour to Ocongate where we will have lunch. In the afternoon, we board our private car for the 3 hr drive back to Cusco, arriving in the late afternoon, exhausted but incredibly satisfied for having completed the trek to Qoylloriti. Note: Thursday is Corpus Christi in Cusco. We organize this trek so that you will be Cusco for this equally colorful and fascinating cultural event. A very dependable and well organized trekking company. I highly recommend Apus Peru team in Cusco, especially if you are planning a more challenging trek.